Citizens First Bank employees recently presented a check to the Clinton County Make-A-Wish representatives at the bank’s Lincoln Way location in Clinton. Citizens First Bank, KROS Radio, Make-A-Wish and the Clinton High School basketball teams all partner to create the Swish for Make-A-Wish program in our community! 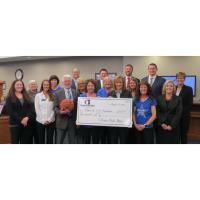 Citizens First Bank has been the sponsor of the Swish for Make-A-Wish program for the past 19 years and donates to the Clinton County Make-A-Wish each time the Clinton High School River Kings and Queens make a three-point basket during the regular basketball season. This year, Citizens First Bank provided $500 to the organization to help wishes come true. Gary Determan, with KROS Radio, commends Citizens First Bank’s support of the program, “It’s pretty remarkable that CFB has supported the Swish for Make A Wish since Day One.” Gary is a long time announcer and supporter of Clinton High School Athletics. Clinton County’s annual Make-A-Wish event is scheduled for Saturday, April 6 at the Vista Grande in Clinton. Tickets are still available, but will not be sold at the door. The theme for the event this year is Red, White and Blue makes Wishes come True. To purchase tickets, or for any questions about how to get involved with the organization, contact Barb Jacobsen at 563-249-9016 or the state office at 1-800-797-9474.